Commercial asks 'Why do we [Americans] work so hard? U.S. luxury car maker Cadillac has provoked anger in France with an advert which pokes fun at countries where workers 'stroll home, stop by the cafe... and take the whole of August off'. 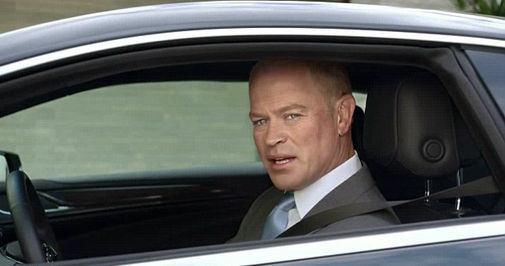 The commercial features Desperate Housewives actor Neil McDonough as a successful businessman who compares 'hard-working' Americans to their counterparts abroad who in his words 'don't work'. He says: 'Why do we work so hard? For what? For this? For stuff? Other countries don't work, they stroll home, stop by the cafe, they take August off. Off. French media immediately took issue with the advert, it was reported by The Local. Website Slate.fr carried the headline 'The lamentable anti-French advert by Cadillac' while magazine Nouvel Obs said it implied the French were 'lazy, spending time relishing their paid holidays'. Last week, it was revealed that workers in Socialist France can now legally ignore telephone calls and e-mails from their bosses when they are at home. It is all part of a new legal agreement which confirms President Francois Hollande’s country as arguably the laziest in Europe. As well as enshrining the 35-hour working week as a cornerstone of French life, his party has cut the retirement age by two years since coming to power two years ago. The French also enjoy six weeks paid leave and extremely generous sick leave and striking rights. Now employers will no longer be allowed to contact staff during the 133 hours of the week designated for rest. In contrast, most Americans have only two to three weeks paid holiday each year.